The day has come to test my patience. The anticipation and anxiety are on its highest levels. I am still wondering if this will really work, and what can I do to make things work and still sustain the good feeling. a true test of love, trust, patience and understanding. Do short talks over the phone, short exchange of texts and receiving short messages matter? I had gone through this kind of set up but I was immature then, though at first it did work, (minus the chat applications that we have now) but then I have known and realized I wasn’t happy anymore, and so I quit. Now that I have to face this again, I said to myself, if I truly love this person, I can endure anything with God’s help. He gave me this person for a reason. And I want to search for that reason and see the wonders that He has given me. He’ll provide answers and will guide me all the way. As what I always hear, cliché as it seems “kapit lang”. I want to take another leap of faith and give myself another shot at this so – called Long Distance Relationship. I feel that there is a need for me to really grab this chance and try my luck once again in this kind of set up. It’s because I want to hold on to what we have and I will learn to keep myself pre-occupied so I won’t long for you too much; to avoid any mindless thoughts that my brain can create. 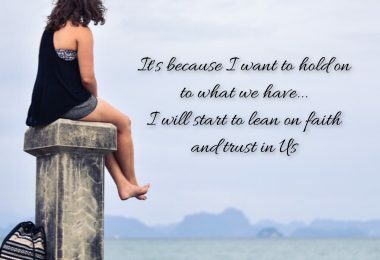 I will start to lean on to faith – faith in you, trust in US and let God do the rest. I know for sure, it’s going to be one hell of a ride. But I will hold on because I want to. I know because we can.